MUGEN Honda Windshield Banner Civic Type R Vinyl Premium Decal Sticker 40"
HONDA CIVIC in JAPANESE KATAKANA Windshield Banner Vinyl Decal Sticker 37"x6.4"
HONDA ACCORD in JAPANESE KATAKANA Windshield Banner Vinyl Decal Sticker 40"x6.5"
HONDA CIVIC Windshield Banner Vinyl Long Lasting Premium Decal Sticker 40"
polkaduck has no other items for sale. 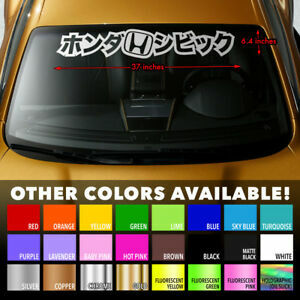 Details about HONDA CIVIC in JAPANESE KATAKANA Windshield Banner Vinyl Decal Sticker 37"x6.4"
Condition: New Size: 37" x 6.4"
There are 120 items available. Please enter a number less than or equal to 120. Sales tax may apply when shipping to: CA*(8.75%), IA*, MN*, WA*. International Shipping: We ship internationally, default service is First Class International through USPS. In some situations, USPS First Class packages have taken as long as three weeks to a month to arrive, so if you do make a purchase please consider this.